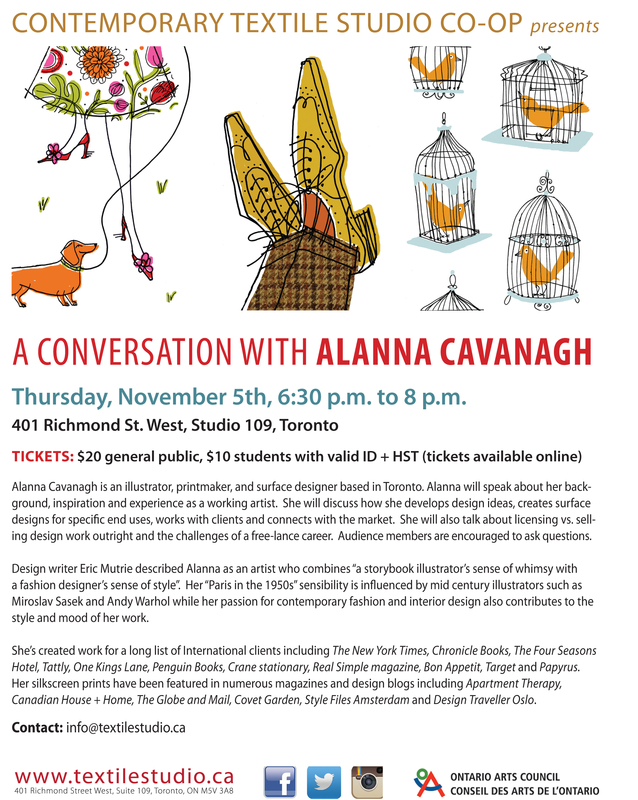 We are super excited to be presenting A Conversation With Alanna Cavanagh on Thursday November 5th, 2015! Check out our poster below and visit our website to for more information and to register for this great event! 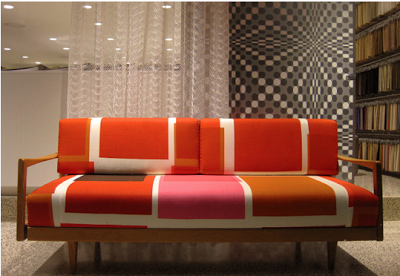 This post is courtesy of our amazingly talented studio member Stephanie Fortin of coeurdeliontextiles. Follow Stephanie on instagram. Hi Everyone! I thought it would be a good time to share this recipe and instructions, that i’ve created for a fun day of Goldenrod dyeing. Goldenrod season is soon upon us and this is a fantastic way to use this abundant plant this time of year. Enjoy, be safe and have fun! canadensis), also called Rock Goldenrod. This species can be found in fields, along highways and open, dry areas between August – October. 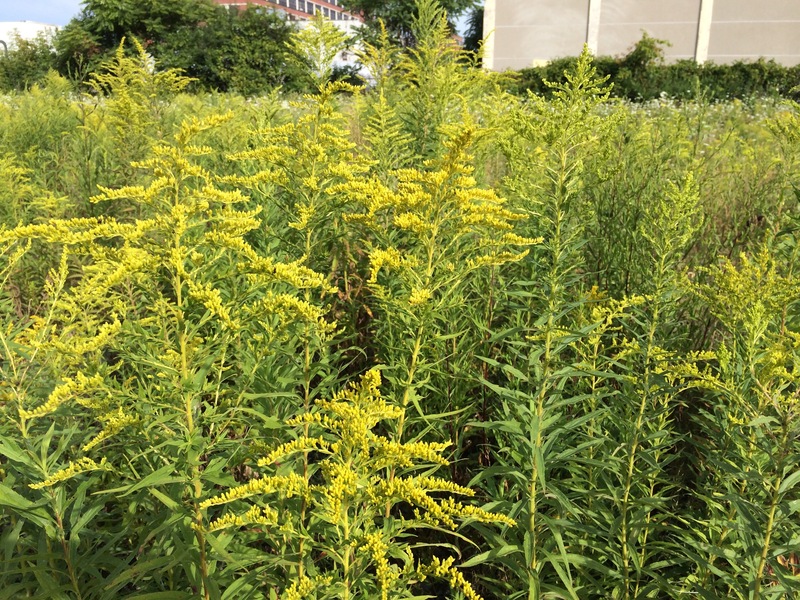 An additional bonus with the Goldenrod plant is that it grows in abundance and spreads quickly, so you can pick freely without disrupting or disturbing the landscape. 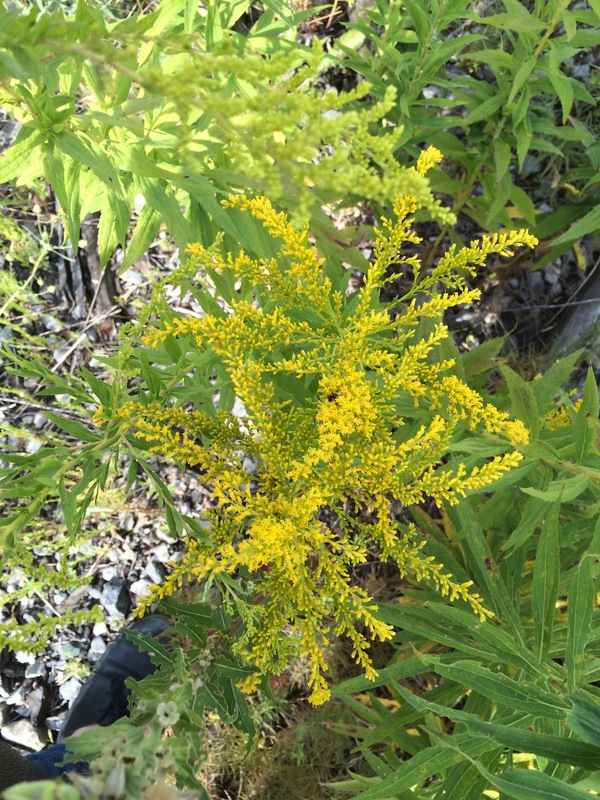 Once you have found an abundant goldenrod growth, you are now ready to harvest. A misconception with goldenrod is that it causes allergies. The plant does not have pollen that distributes with wind, therefore is not an allergy irritant. There may be ragweed in the area and you might want to take an allergy pill before you begin harvesting. I will also warn you that there will be many bees and beetles within and on the goldenrod plant. Be careful when you are reaching and cutting stems. If you are allergic to bees, please keep this in mind and take proper caution. Even though Goldenrod grows rampantly, try not to completely deplete plants in one area. As there usually are many plants together, this is easy to do. When cutting stems, cut the flower and stem, both are great for dyes. Earlier blooms will produce more vibrant dyes. With gloved hands and sun protection as you will be in open areas, cut and collect stems with flowers, in your bag or container. Collect as little or as much as you want. Once you are back at home or in your creative space. You are ready to prepare your plants. There will be many small insects in your plants, I suggest doing this process outside if you can. Separate the flowers from the stems, (optional) The flowers on their own will yield brighter yellows, while the stems will yield green yellows. If you decide to keep them all together in one dye bath you will get a mixture. 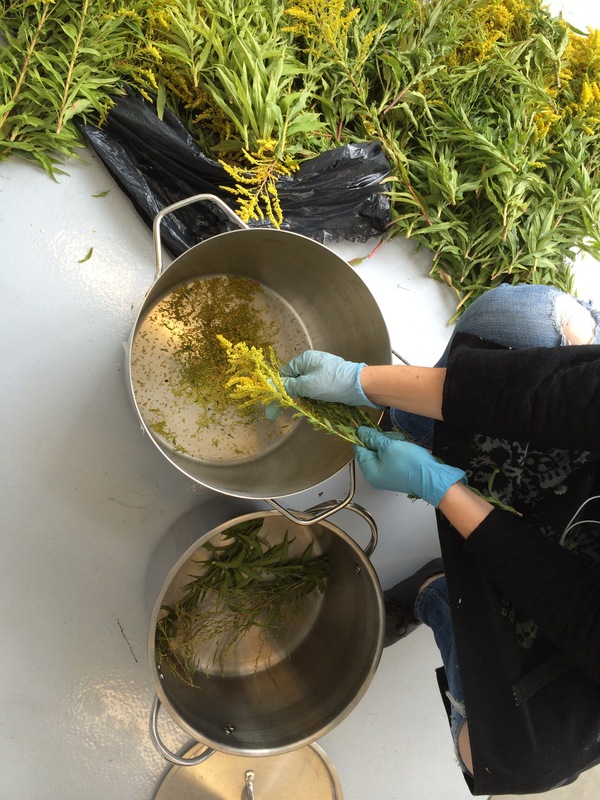 Place the goldenrod into your dye pot. 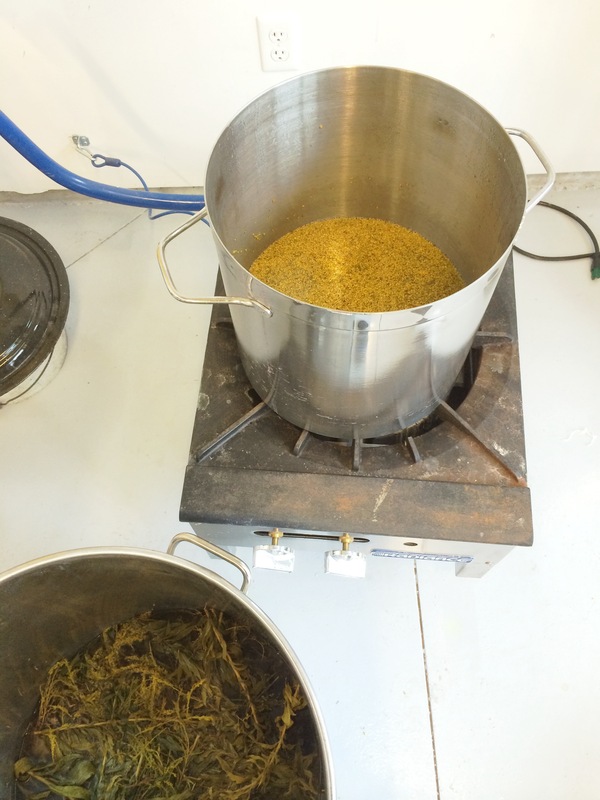 Once you have the goldenrod in your dye pot it’s time to obtain the dye. The dye pot must be stainless steel or enamel so that it does not react with the dye. 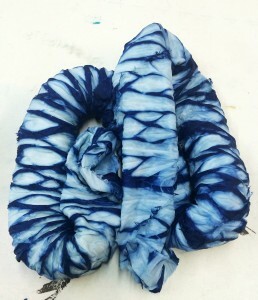 When cold dyeing you can also use plastic or glass. You will keep notes on things such as the weight/amount of plant you are using, amount of water, WOF (weight of fabric), for your own use, this is not necessary if you do not want to recreate in future. Once you have your plants in the pot, cover the plants entirely with water and bring to a boil. Boil for 20 min and simmer for 3 hours. (you can alter the time and experiment as you wish) Add water as needed. The more water the lighter the shade. The dye will release from the plant in the process. Remove the dye after time from the plants with a strainer and repeat the process if more dye can be removed. Now that you have your dye separated from the plant. Discard your goldenrod remnants into the compost and prepare your fabric to dye. 1. Fabric – protein (animal – silk, wool) Synthetic fibres will not dye. If you are over dyeing a garment, the thread will most likely, not dye. Silk or protein results are the best and easiest. This recipe is for protein fibres, cellulose fibres require additional instructions. To Begin, weigh dry fabric to get the WOF and write this down in your notes. 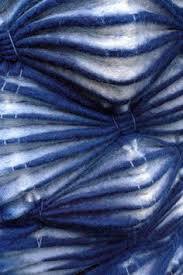 Before dyeing any fabric, it should always be washed or scoured, to remove any dirt, so the dye will bind properly. 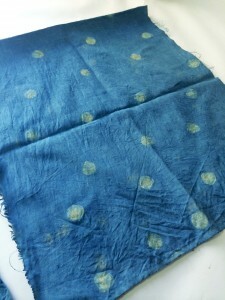 Soak the fabric in water and wet it before dyeing. If you wash or scour your fabric right before, leave it wet. The fibres will loosen when wet and allow the dye to sink in easier. This will result in an even dyeing. 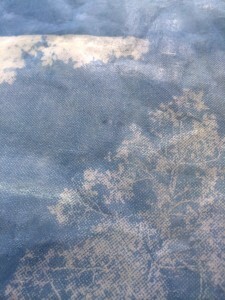 To create a bond between the fabric and dye you must mordant your fabric. 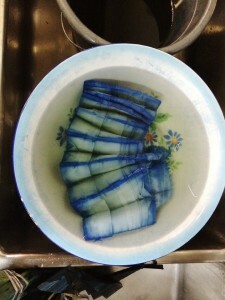 Mordant, which means “to bite”, is added during the process to fix the dye, this helps it become washfast and lightfast. Depending on what type of fibre you are using you can use many different mordants. We are using silk, iron and alum in my examples. Metals are commonly used as mordants, some plants act as mordants and a few plant dyes do not require mordants. We no longer use harsh metals such as tin. Always exercise due diligence and make sure safety comes first. stores. Another option is to find an object created out of iron, soak it in a jar of water for a length of time and the water will become the mordant. Try placing the item into the dye pot if you are ok with the pot being contaminated with said mordant. The possibilities are endless once you know the basics. Always check safety regulations for anything you are using if you are unsure. 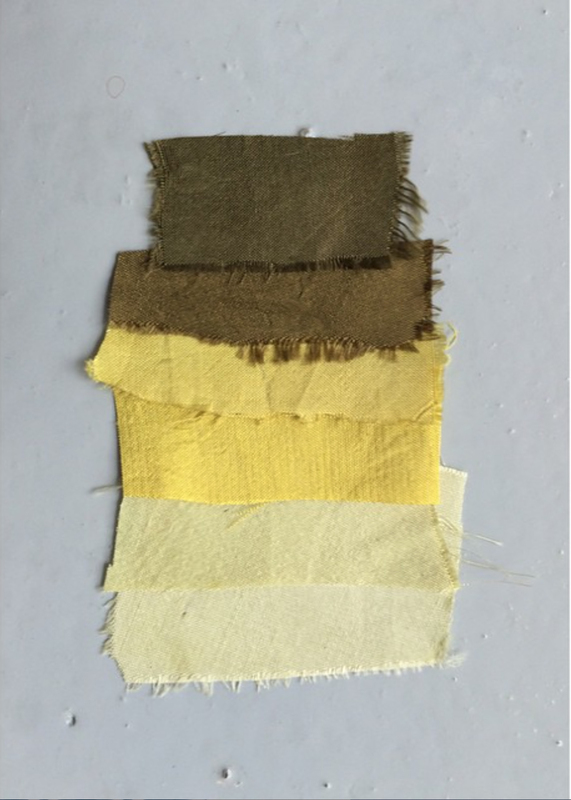 You can yield a wide range of colours by altering the ph levels of a natural dye bath. Experimenting to see what works best for you is a great way to learn once you have the basic idea. Mix 5-8% WOF for cellulose and 15% WOF for protein if using alum. Mix 2-4% WOF when using iron. Be careful with iron, too much can damage the fibres and make your piece brittle. You should have 1 dye bath, 1 alum bath and 1 iron bath set up at this point. You’re ready to dye! 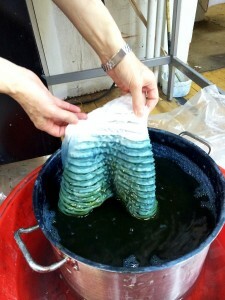 Immerse your wet fabric into the dye pot. The stove does not have to be on during dyeing, If the water is warm it will dye easier and faster. Dyeing cold is a possibility. Keep the dye bath at 60 degrees celsius (about the temperature of hot tap water) or heat occasionally for the best results. 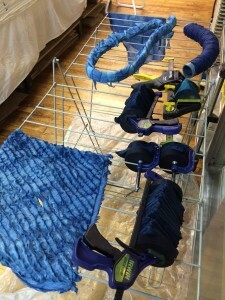 Move your fabric within the dye for even dyeing. Once you see colour forming, the time it is in the dye bath is up to you – take notes and experiment. The longer it is submerged the darker the shade will be. 15 min minimum recommended. Once you are happy with the shade, you will now rinse the fabric and repeat in a mordant bath. Alum will brighten the colour while Iron will darken and grey the shade. You can repeat these steps as many times as you’d like until you are satisfied. 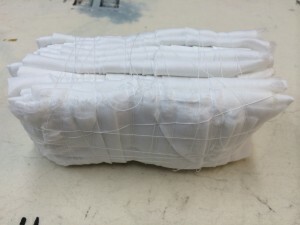 You can also start with the mordant and see what happens, this is called pre mordanting your fabric. You can even do this in advance, experiment and see what happens. 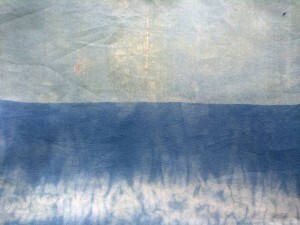 Mixing 4 parts water and 1 part vinegar immerse your dyed fabric and rinse to help in setting. 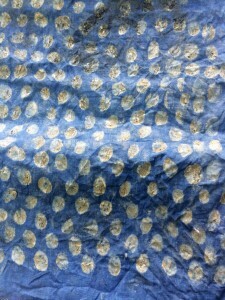 Wash and dry the fabric and you have completed golden rod harvesting and dyeing. Congratulations! I hope you have enjoyed this fun experiment, if you want to learn more, get in touch and I will update you on the next round of natural dye workshops. Have a wonderful time dyeing! 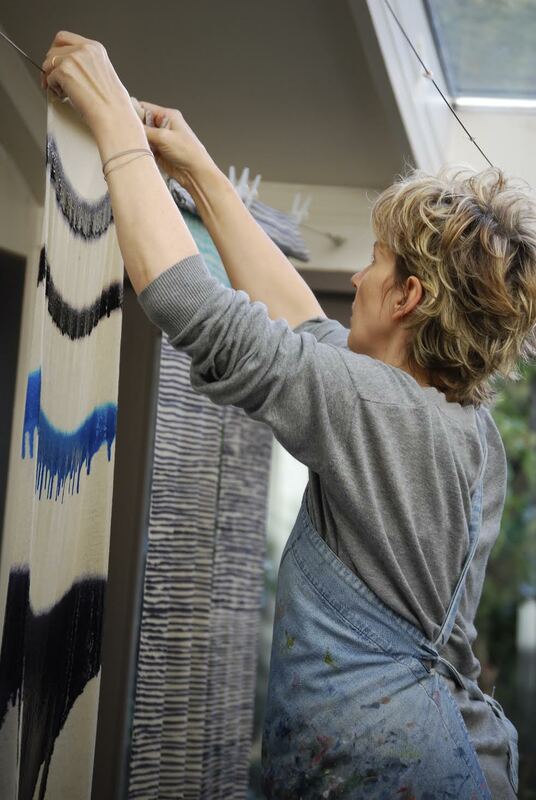 The Contemporary Textile Studio welcomes the renowned UK artist Kate Blee for a 3-day public workshop at our studio and an artist’s talk on Wednesday, June 24, at the Textile Museum of Canada, 55 Centre Ave. Toronto. Kate’s workshop will focus on discovering colour relationships through a spontaneous, reflective and playful process. Using dyes mixed to a variety of viscosities, and exploring unorthodox methods of applying dye or pigment to textile, students will discover a personal and experimental process of working as well as an appreciation of imperfections and anomalies as they arise, and a greater understanding of the nature of cloth in relation to dye. 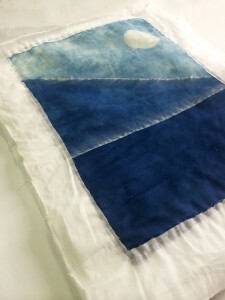 Kate says of her approach, “ it is not about a controlled and predictable, planned process from beginning to end, but about making an unpredictable and sensitive journey through process.” The workshop will encourage you to be observant and spontaneous, playful and attentive as you explore the interactions of colour on cloth. Wednesday, June 24, 2015, 6:30 p.m.
Kate Blee studied at Edinburgh College of Art and then set up her own studio in London in 1986. 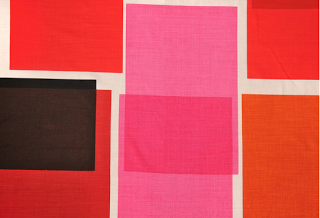 Kate’s work is an exploration of colour relationships. She is interested in the place where colours meet, and explores the movement of colour through its medium. Her work is characterized by an elegant and deep understanding of colour interactions and rhythm; she allows for both irregularity and anomaly in her approach. Kate Blee has been involved in a wide range of art and design projects including exhibitions, installations, and commissions as well as working with architects and manufacturers. She has worked with architects such as Sir Michael Hopkins, Studio 54 architecture, Avanti architects, Rivington Street Studio, Allies and Morrison and Wilkinson Eyre. 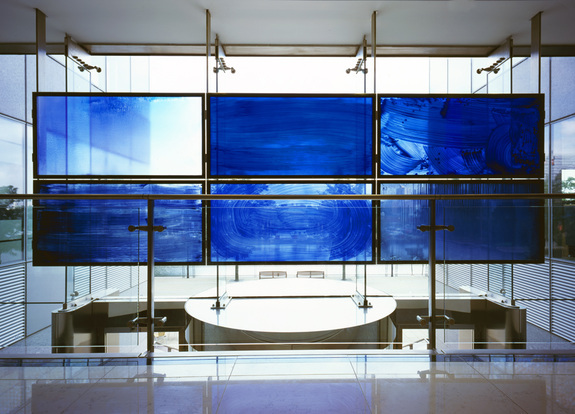 Her glass architectural installation for Canary Wharf shows her painterly approach to surface, while her outer glazed wall at Southmead Hospital employs colour rhythm on a large scale. You can see some of Kate’s work with Christopher Farr carpets here. 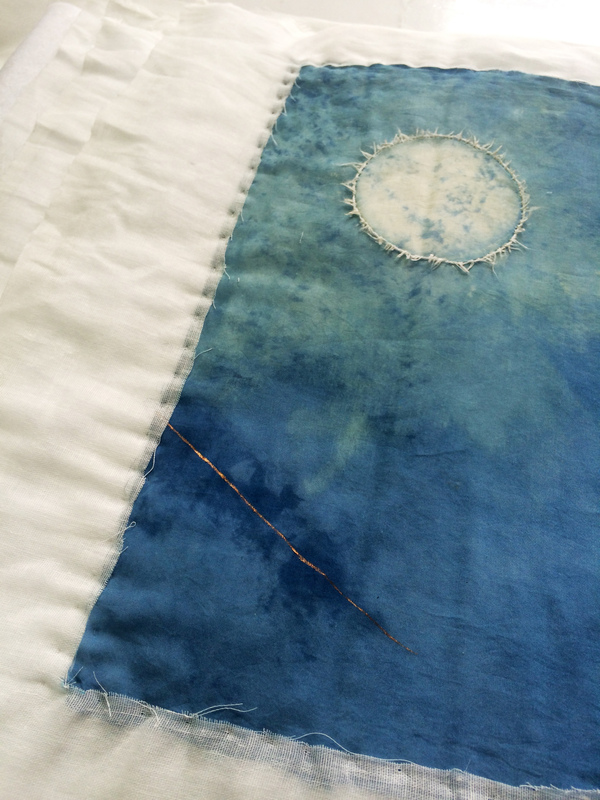 The Textile Studio has maintained a fantastically strong vat since Yoshiko Wada’s visit, and we have been exploring and expanding upon the methods learned in her workshop every Friday since June. As well, we have been experimenting with resist pastes made of clay or rice powder. The resist pastes can be applied as paint, can be screen printed, can be block printed – it opens up an entirely new world of print-making to a simple piece of cloth being dipped in indigo. Studio member Munira Amin has been working with clay resist, experimenting with the consistency to make the medium most workable for her graphic repeats. 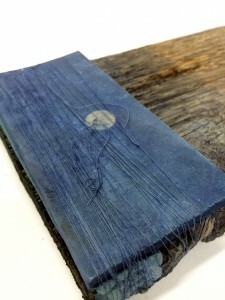 In some of her work below, we can see the results post-indigo dip. 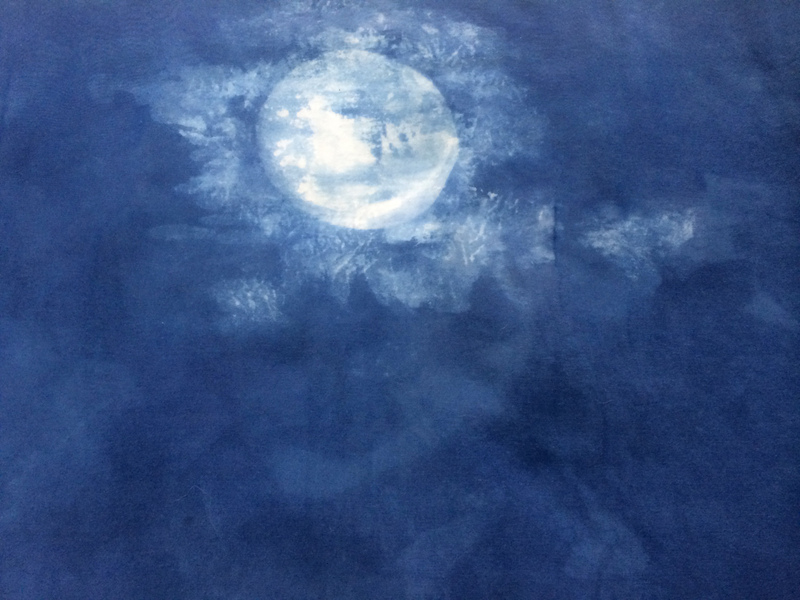 Studio member Ganaele Langlois has taken up rice paste as her resist medium of choice – experiments involved screen printing fine images onto fabric to resist dye when the piece was dipped, as well as hand painting the paste to create cloudy images paired with a circular clamping technique – very effectively creating a moody moon effect. She also used ori-nui stitch resists, and the sum of these experiments are to form the background of a cloth book, as you can see here. 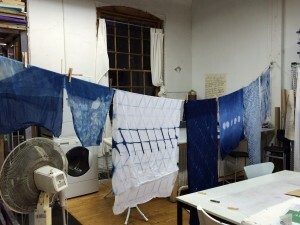 Summer resident Jenny Boucher worked with number of folding and binding techniques to create large panels of shibori cloth. 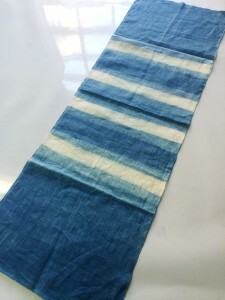 She experimented with yukata pleating, itajime clamping, and arashi pole-wrapping shibori. 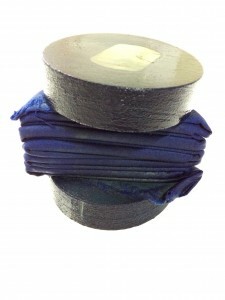 Double folding in multiple directions creates wonderful striping effects when bound and dyed in the indigo. 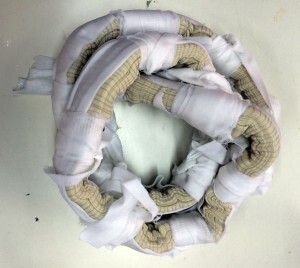 Seen below: fabric folded pre-dip, and unfolding in a water bath after. The arashi method proved particularly water-like and effective on this piece. 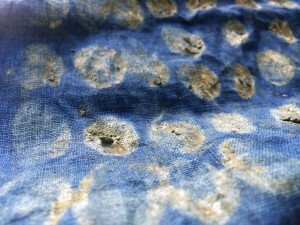 More experiments to come as we begin to delve into the world of mordents, iron, natural dyes and discharge dyeing. Information about clay resist can be found in Michel Garcia’s DVD workshop. The pdf recipe for the rice paste resist can be found on the Maiwa website. Hey folks! 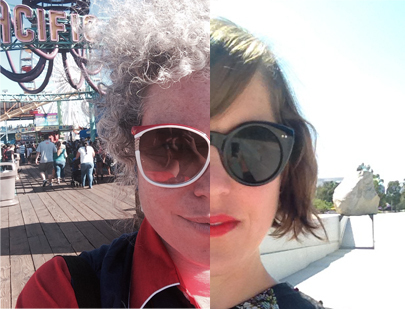 Roving fashion reporters/artists Meghan Price and Kate Jackson recently returned from the Textile Society of America Biennial Symposium in Los Angeles, California. Immediately struck by the fashion flare of their fellow textile connaisseurs, the two have brought us this visual spectacle to enjoy. 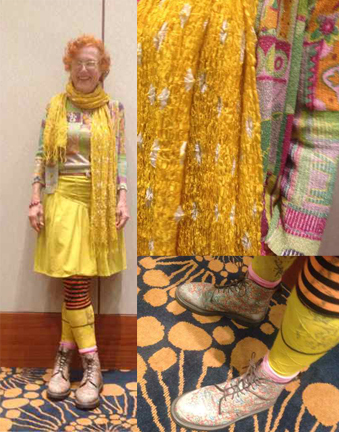 Ray of sunshine and jacquard weaver Ruth Scheuing at the TSA Awards Banquet. 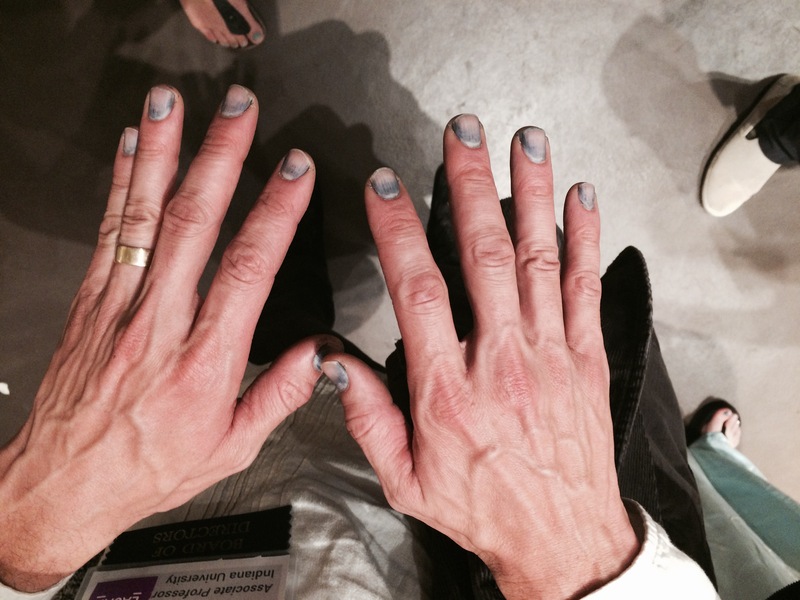 From Kimonos to fingernails, indigo was EVERYWHERE! Tatsuhiko Murai of Ooigawa Kudzu-fu Weaving Studio was showing in the marketplace at the symposium. He wore some amazing clothes each day and told us all about weaving and dying his cloth. Very Impressive! 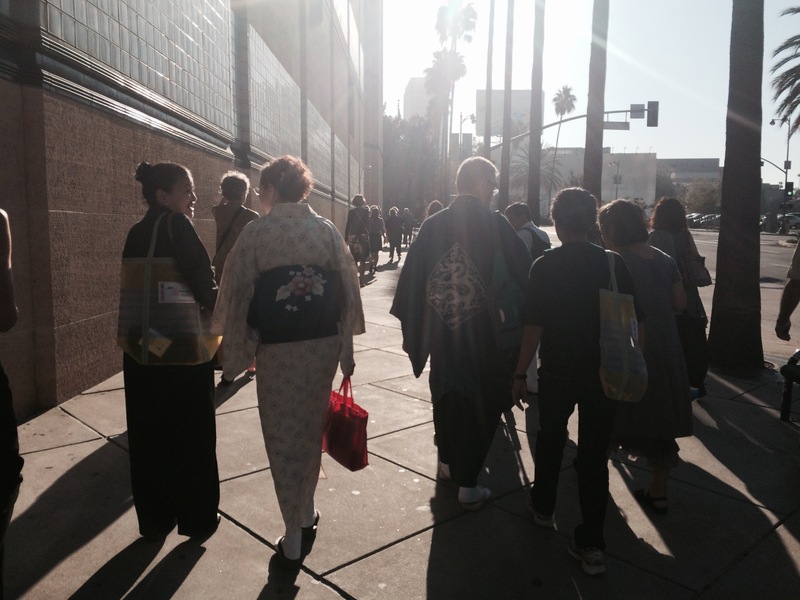 We spotted Tatsuhiko Murai and company walking with World Shibori Network’s Yoshiko Wada in the early morning California sunlight. From Indiana University- symposium presenter, Rowland Ricketts has THE best fingernails. Some people were head over heels for his curls (not pictured) but we loved his manicure! 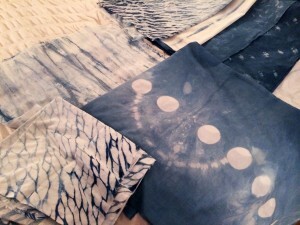 Rowland’s presentation on his current work and indigo processing was so inspiring. We just learned his studio is a 2014 Crafts Finalist with Martha Stewart American Made. 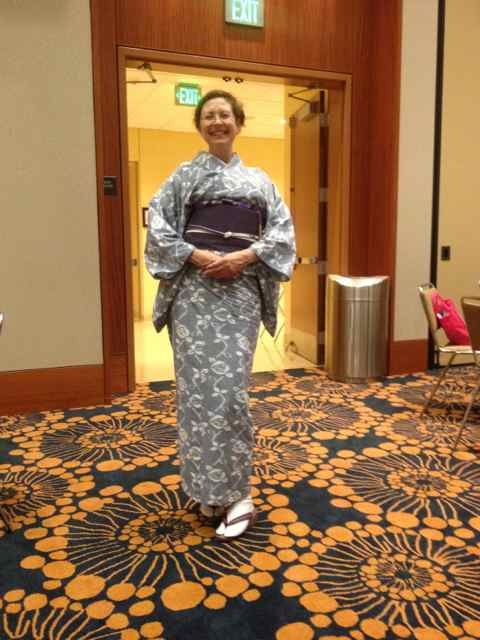 Karen Mack has been living and teaching in Japan for 15 years. 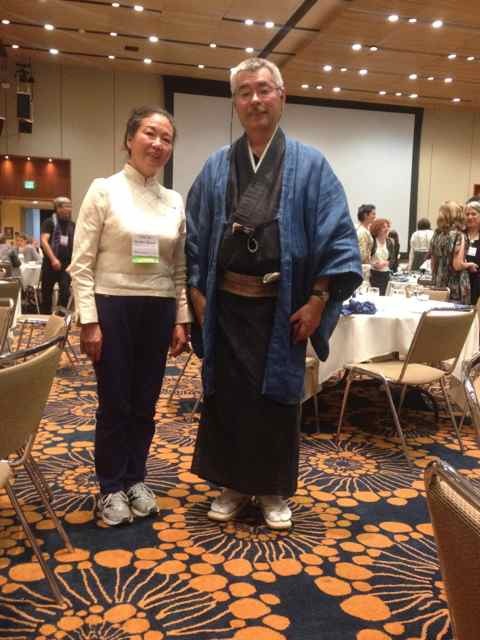 She donned a different kimono and obi every day of the symposium. Remarkable! 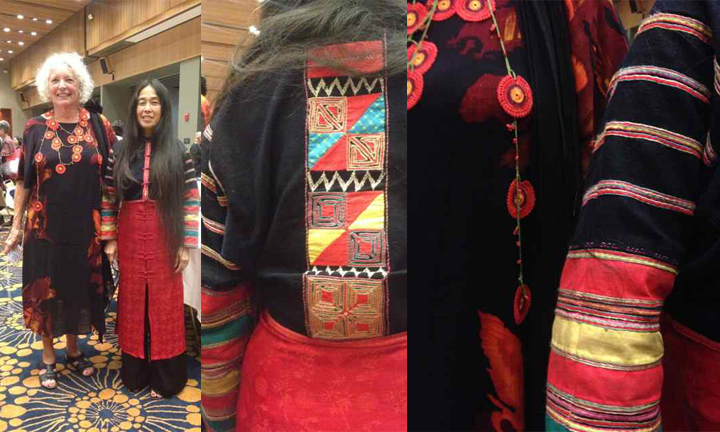 Textiles from Turkey and Vietnam stand side by side. Such great texture, pattern and colour. 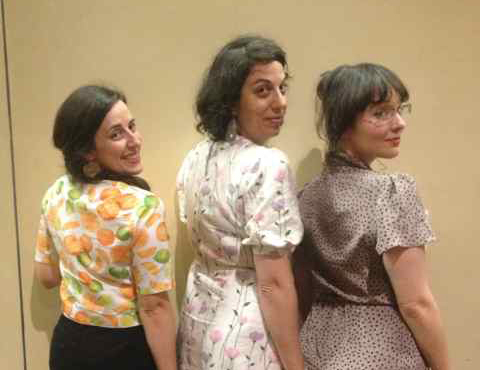 Speaking of pattern and colour, representing Hamilton, Ontario – these three super smart ladies Thea Haines, Jen Anisef, and Tara Bursey of Pulling Strings glammed it up on Friday night. Their presentation Textiles, Community and DIY in Post-Industrial Hamilton, heard earlier that same day was most certainly a highlight of the symposium. 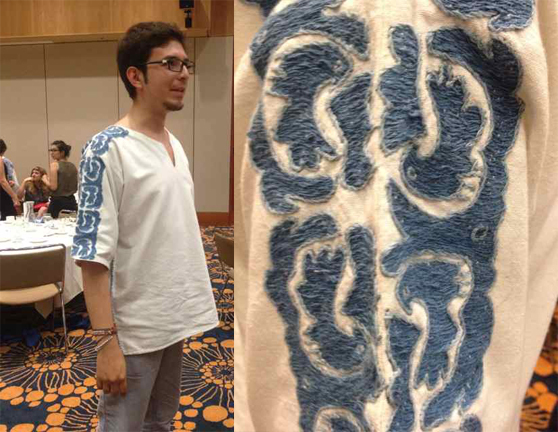 Hector Meneses is working with local craftspeople and traditional techniques to create products for the Textile Museum of Oaxaca gift shop. 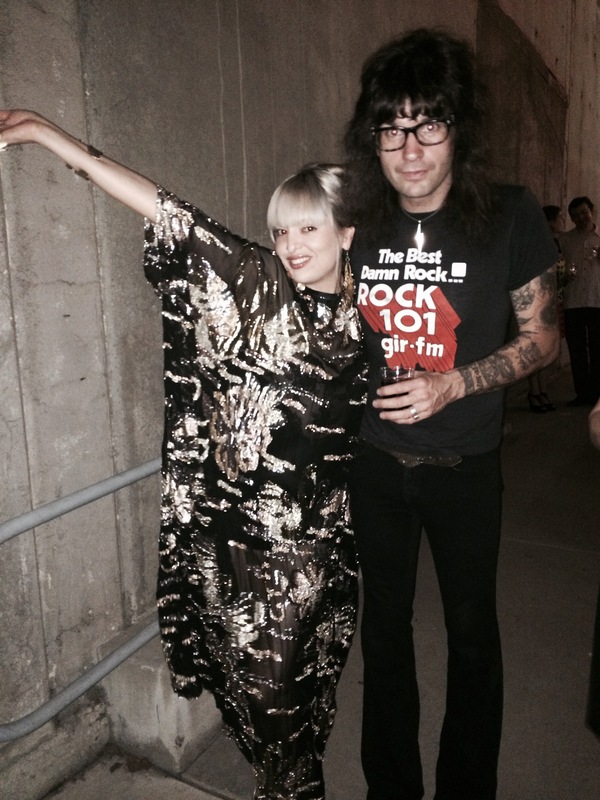 This shirt is a prototype and we love it. 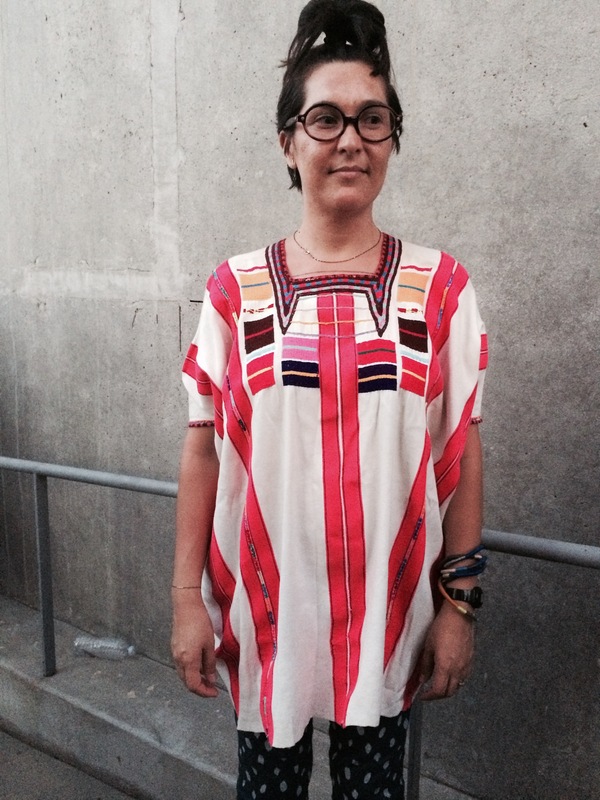 Tanya Aguiñiga has a line of jewellery on etsy that funds her stellar art practice. 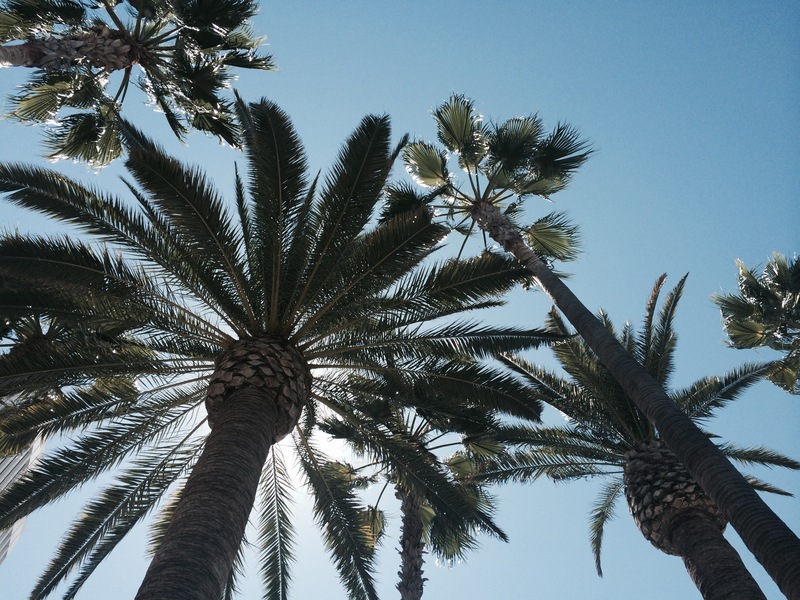 Meghan got to visit her studio and other dreamy California studios during one of the pre-symposium field trips. There really were just so many clothes and shoes on so many interesting people that we heard amazing stories about. But way too much info to share in this post. 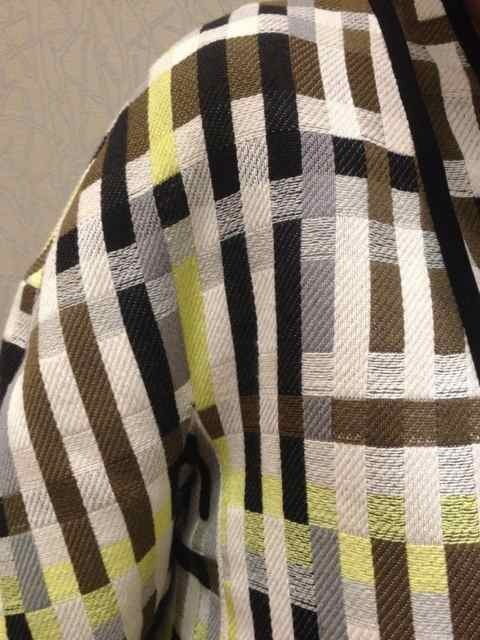 Feast your eyes on some of the textiles we snapped photos of. The next symposium is in Savanah, Georgia in 2016, keep your eyes out for calls for entry and start planning your outfits now. Maybe we will see you there! Melanie Egan on Botanica Tinctoria – In Selvedge Magazine!